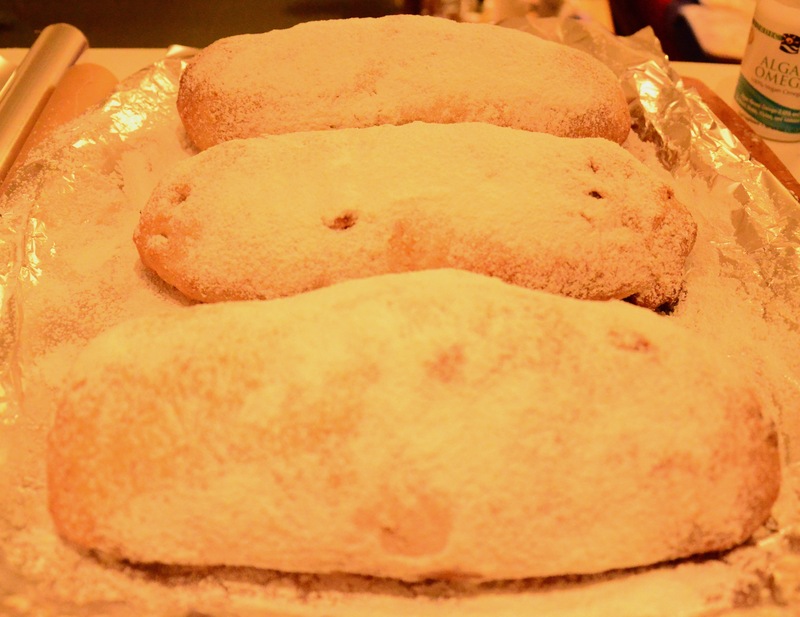 I have been making Stollen for Christmas for a few years. Clearly alcohol laden fruitcake is the Irish tradition, but I never liked it much. I was the person who ate the marizpan off the outside! I came across a wonderful recipe for vegan stollen here on “Seitan is my motor”. The instructions are very clear! Which is what won me over. I was previously a bit intimidated by enriched dough. Knowing if you have kneaded enough, throwing the yeast in on top of the salt and immediately killing it ( 😦 ) etc. Kneading is all about getting your back into it and not being tempted to add more flour 🙂 Once you make this you will realise it can be done, to delicious results. I have adapted the recipe a little and I make my own marzipan for it. My changes are few, you have to respect yeast no messing with the recipe too much or the magic chemistry will be off. I use coconut oil instead of margarine, I use a third of a cup. I rub it with coconut oil too. As you would expect because I am a vanilla fiend I use a generous dessertspoon of vanilla powder. Finally I do not like raisins- I can stand a sultana in a scone …but raisins eep! and shiver! so I use two thirds of a cup of chopped organic un-sulphered apricots in my stollen. It takes a little planning. You make the plain dough the night before and leave it to proof in the fridge. You bring all to together, shape, leave to rise and bake the next evening. Here is mine naked out of the oven ! Ready to wrapped and hibernated for a bit. Since I make my own marzipan I put my rose flavour into that instead of the mix. You just cannot get good quality marzipan here. Since I buy my ground almonds in bulk … because I bake so much… it makes sense to make my own. Marzipan is a wonderful human invention! So versatile! The almond-y heart of your stollen perhaps little marzipan balls that you can dip in melted dark chocolate and leave to set in the freezer. Tasty treats for over the holidays. *mine is in an almond oil base as pure rose oil is like twenty five euros a bottle! Put your dry ingredients in a bowl. Make a well in the centre and add the wet, not the water though! Press it all together. If it still a little crumbly you can add your water and press it together again. It should form a ball like biscuit/ cookie dough. Cover in tinfoil/ baking paper and leave in the fridge for at least a half an hour. 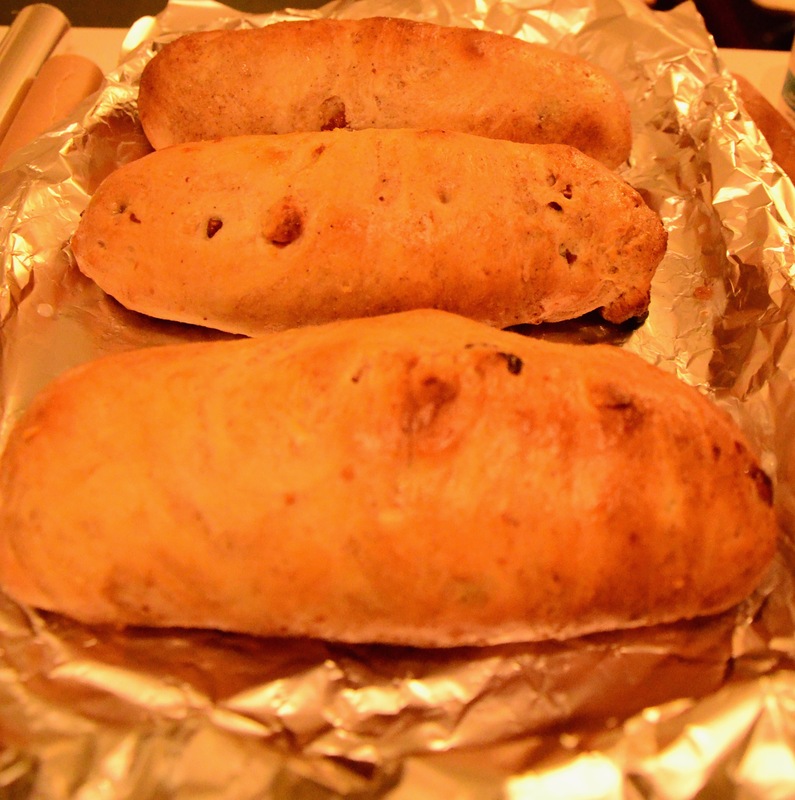 If using in your stollen you will be rolling into three little logs. If you plan to make marzipan chocolate balls you will have billions of them!!! So maybe half the recipe, you could also leave out the rose and use orange zest and a little orange oil or orange flower water instead!? Hope you guys try it. It really lasts, unless you end up eating it really fast, which has been known to happen. If you are clever and hide one, you can toast slices of it too, sooo good!! !